Tuas mega port may have lively area for leisure. 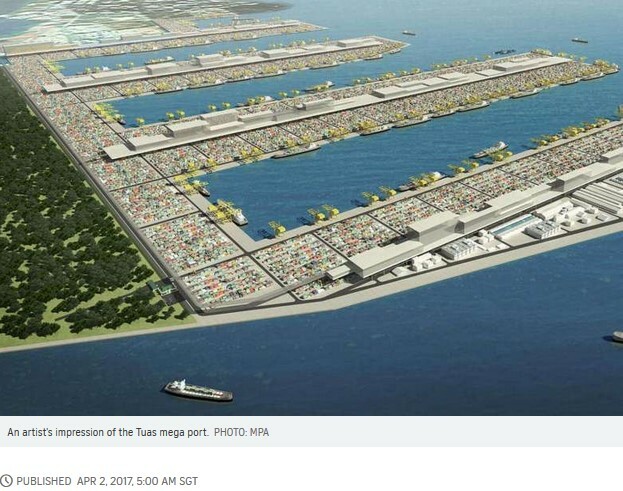 The Tuas mega port, slated to open in phases from 2021, may be more than a hive of container traffic. Cafes, retail stores and even a jogging track overlooking the hustle and bustle of trade are being considered in a bid to optimise land use and add vibrancy. The plan, which is being studied, is to construct an elevated area 42m above ground to house such and other amenities. This area, which would be partly open to the public, could be as big as 150ha, or the size of about 200 football fields. This is about a tenth of the space below where port activities, including the loading and unloading of containers, will be carried out. The Maritime and Port Authority of Singapore (MPA) is also considering having other port-related businesses at the elevated site. Speaking to The Sunday Times, MPA’s project director (next generation port) Eugene Khoo, said that while the plans are not confirmed, provisions are being made in the construction of the new port to ensure that the foundation and infrastructure will be strong enough to support such a development. Construction of Tuas Terminal enters Phase 1 of development. Bringing in large retail outlets, such as Tesco and sports-based Decathlon that can pull in the weekend crowd, is also being considered. To make the overall port operations more efficient and seamless, MPA is looking into having facilities such as warehouse and distribution centres – now fragmented in many parts of Singapore – at the port as well, he said. Mr Scott Dunn, vice-president for South-east Asia at engineering firm Aecom and vice-chairman of the Urban Land Institute (Singapore), said the plans showcase a “responsible use of land”. The stacking and layering of facilities is an innovative solution that works in land-scarce cities such as Singapore, he said. Globally, a growing number of ports, including those in Japan, Europe and the United States, are exploring new initiatives to build port cities complete with leisure and other amenities. For Singapore, the challenge will be to attract enough people to visit the port, said Associate Professor Yu Shi-Ming from the National University of Singapore’s department of real estate at the School of Design and Environment. He said that if plans for a Tuas South MRT extension materialise, they will improve the area’s accessibility. “These are very exciting plans,” he added. 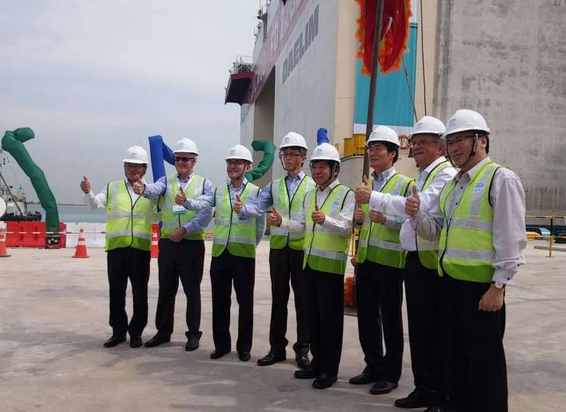 The mammoth move of port functions from Tanjong Pagar, Pasir Panjang, Keppel and Brani to Tuas South will allow Singapore to handle about 65 million twenty- foot equivalent units (TEUs) of cargo a year – more than double what the port handled last year. The maritime sector contributes about 7 per cent to the country’s GDP and employs over 170,000 workers. The plan is to move into Tuas progressively from 2021 and the entire migration will be completed only by 2040.